All activists: Sign our petition to thank businesses that are taking ground-breaking actions to curb global warming. 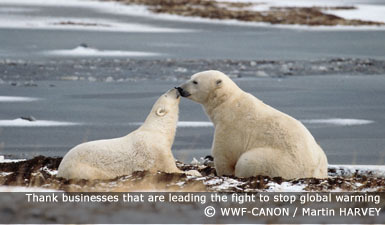 WWF will send the petition to the companies that are participating in our Climate Savers program: Catalyst, Hewlett-Packard, IBM, Johnson & Johnson, JohnsonDiversey, LaFarge, Nike, Nokia, Nokia Siemens Networks, Novo Nordisk, Polaroid, Sagawa Express, Sony, Spitsbergen Travel, Tetra Pak, The Coca-Cola Company, The Collins Companies and Xanterra Parks and Resorts. We will not post your information or provide it to anyone else.